In the time since my last post about my Query Store pre-con at the PASS Summit (it’s just about a month away!) I’ve gotten several more questions about the session. I’ve consolidated them and provided answers here, and if anyone still wants to know more, please email me! What version of SQL Server will you be running? With the announcement on Monday from Ignite about SQL Server 2017, I can now say for certain that is the release I will be using. I will call out differences between SQL Server 2016 and SQL Server 2017 as needed. I don’t expect everyone who’s attending to be running 2016 or 2017, but I do expect that you’re in the planning stages for an upgrade, are going to start planning soon, or you’re looking for some solid reasons to share with your company about why you should upgrade. I would argue that Query Store is a very good reason to upgrade, but that is definitely not the only one (check out the new features list for SQL Server 2016 and SQL Server 2017 – including enhancements to Query Store). Will you have labs during your session? No, but I will make all scripts available for attendees, and if you want to follow along during the day, you can get the scripts that morning. I tweak demos right up until a session – it’s what I expect to be doing the Sunday before. I’ll have all the scripts on a share that attendees can access the morning of the 30th. I *love* the idea of labs during a pre-con, and I know that some other presenters do them. Huge props, as it’s not easy to do. In order to cover everything I want to cover, I don’t have enough time for in-depth labs that everyone can walk through from start to finish in the time allotted. But again, feel bring to a laptop with SQL Server 2017 installed, along with the latest SSMS, and you can follow right along. Are you giving anything away? Besides knowledge?  Yes, I will have codes for 30 days of free access to Pluralsight, which gives you access to over 50 courses from the SQLskills team, including my 3-hour course on Query Store. If there’s something you miss during the pre-con, you can watch the Pluralsight course to pick it up, or further enhance what you learned. 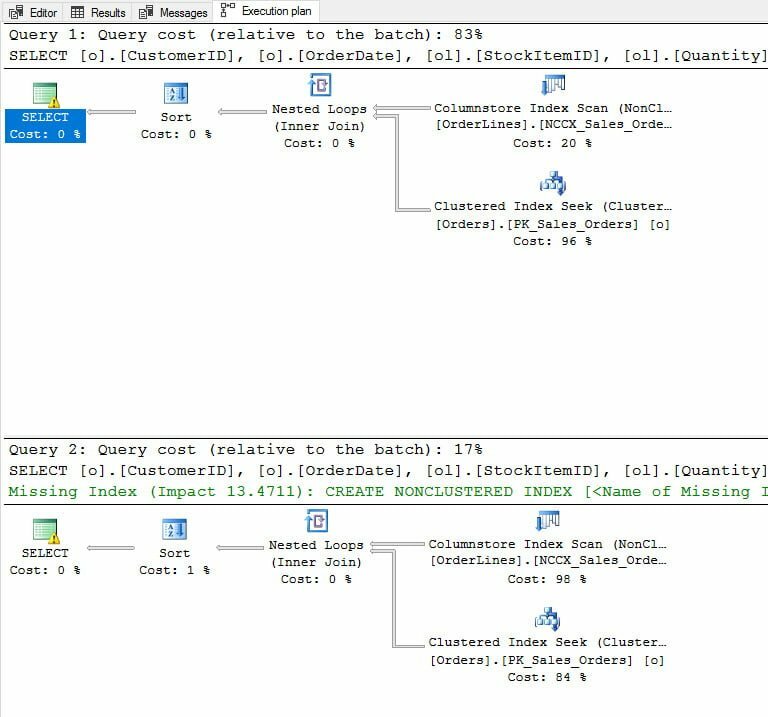 I’m also working on a new course about the enhancements to Query Store in SQL Server 2017 and Automatic Tuning, which I’m also covering in my full day session. I’m also hosting a panel session at Summit and the organizer has emailed me to discuss how we handle questions during the session. In the case where there are a large number of attendees, sometimes people hesitate to ask questions, and sometimes it can slow down the flow of the session. While I am not setting records in terms of attendance, there are a lot of people that have signed up (which is fantastic) and I do want to make sure that everyone has a chance to ask their questions. I’ve thought about using Twitter, and I know that Slack has been suggested as an option. I’m still thinking about it. If you’re signed up and have a preference, feel free to let me know in the comments! That’s it for the moment, but please keep those questions coming. Again, I want to make sure this is the right session for you to attend – there are a lot of great choices this year! Either way, I look forward to seeing at Summit next month! 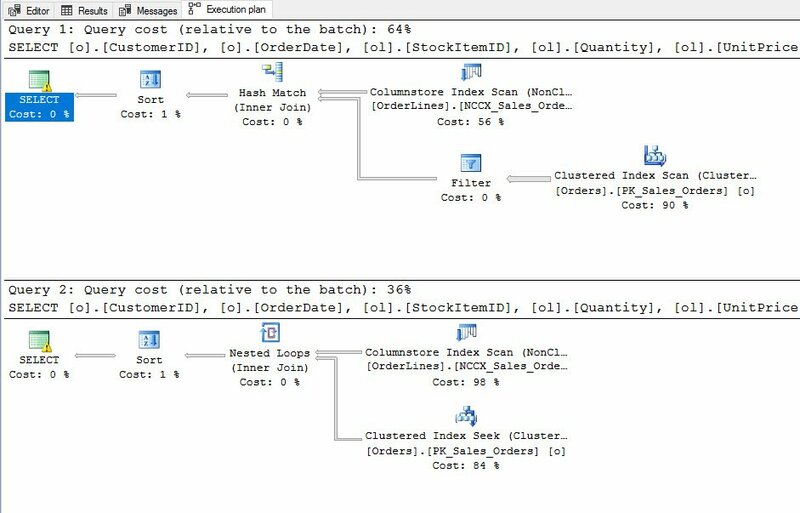 In this week’s Insider newsletter, Paul talked about an interesting customer issue I ran into last week related to Query Store, and an inadvertent change to a query’s text. I thought I’d provide some demo code so that those of you using (or planning to use) Query Store could see how this shows up in your database. I started by restoring a copy of the WideWorldImporters database, which you can download here. I enabled Query Store and cleared out the data, just as a precaution. Then I executed the stored procedure twice, with two different input parameters. I purposely used WITH RECOMPILE here because I knew the values would generate different plans. Plan_id 1 has a clustered index scan with a filter, that feeds into the probe phase of a hash match (with a columnstore index scan for the build). This was generated with the input value of 90. Plan_id 2 has the same columnstore index scan, but it feeds into a nested loop, with a clustered index seek for inner input, and was generated with the input value of 224. At this point, if I re-run the stored procedure with the two different input parameters and WITH RECOMPILE, I will get the plan with the nested loop. Now…let’s assume that this forced plan is used going forward and there are no issues. And then let’s assume that a developer decides to add some comments to the stored procedure, and they know they should use ALTER to keep the object_id the same…but somehow, a couple extra spaces end up in the query. p.s. did you see that they announced the release date for SQL Server 2017? I’ll be running that build at my pre-con! I received an email over the weekend asking about my pre-con at the PASS Summit, my general session at the Summit, and my Query Store course on Pluralsight. The individual wanted to know the requirements for the pre-con, and what overlap exists between these three. Great question. None of these courses require pre-existing knowledge of Query Store. The Pluralsight course starts at the beginning and walks you through configuring and using Query Store in SQL Server 2016 in find performance issues both retroactively and proactively (3 hours total). The general session at the Summit discusses Query Store at a high level (what it is and how to use it), and talks about the new Automatic Tuning feature in SQL Server 2017 (Automatic Plan Correction) as well as Automatic Index Management in Azure SQL Database (75 minutes). then the pre-con is going to give you all that and whatever else I can find time to fit in. It is a packed day and I am in the thick of pulling all the slides and demos together (so if there’s something you want to see/know that you don’t see mentioned here, feel free to email me!). I hope this answers any questions you have about my pre-con at Summit and other Query Store sessions available, but if not, just contact me! Have a great week, and to my friends in the south – the Stellato family is keeping you in our thoughts.